Pin Clock Brings Back Childhood Memories | OhGizmo! By Chris Scott Barr on 11/26/08 • Leave a comment! I remember having one of those neat pin art sculpture things when I was a kid. You know, the box with silver pins that made the shape of whatever you pressed against it. I think the original intention of this crafty device was to allow people to prominently display their middle finger without the effort of actually flipping the bird. I could be wrong, but that’s about all I ever used mine for. Anyway, if you want to relive the nostalgia of your youth, this Pin Clock may suit you. 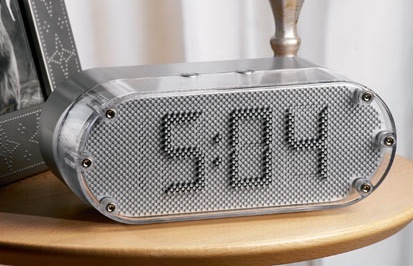 This simple clock works on the same principal as the toy, only this one tells the time. While I find it a bit amusing, I don’t think I’d pay $60 for one of these. First, it doesn’t even function as an alarm, and second, I don’t think it’s set up to display fingers.